The Year was 1837. It came to John Deere’s attention that the farmers of the area were having some major problems with their old cast-iron plows in the thick, rich soil of the Midwest. John made his first self-cleaning plow out of steel from an old saw. 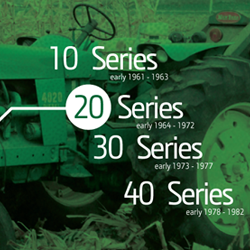 It worked like a charm and John Deere, being the innovator that he was, did something quite unusual at that time. John started making his new plows before he ever got any requests for them. This was unusual in that blacksmiths made items only on demand for their customers. Fast forward to the present and you will find GPS, self-steer and the latest and greatest mobile offices right in your John Deere. What’s your favorite era? How about a favorite tractor? Let us know in the comments.